And here it is. We are implementing a heartbeat system which works this way: player has to watch their pulse and react when it’s going too low or too high. Many things can have impact on our heart – from Phantaruk groans and roars, toxins, tiredness and magnetic fields to virus that attacks our immune system. But we aren’t completely defenseless. 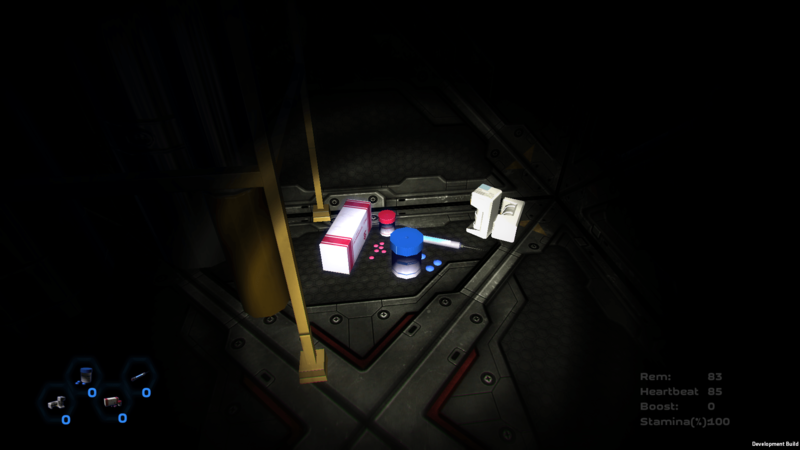 As a player we can still use medicaments which will help us survive. Adrenaline which is best for quick stamina increase, speeds up our heartbeat on the other; Propranolol, which is, by the way, a real drug (Propranololi hydrochloridum), slows down the heart and gives us a chance to run away from danger. I want to intend one paragraph of this entry to the virus. I don’t want to disclose its name, because I don’t want to ruin exploring the game lore. However, the virus can be a real problem if we don’t have reserves of antidote. Imagine that it’s slowly, step by step, increasing your heartbeat to the maximum level. Your heart will be very vulnerable for the cardiac arrest. And you can’t kill the virus – you can only take your medicine and have hope. and remember: Phantaruk is lurking.